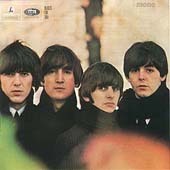 The Beatles "Beatles For Sale"
'cause I looked up to your face. Heard before when you gave me no reply. And though he'll never come back, she's dressed in black. One day you'll look to see I've gone. Some day you'll know I was the one. But tomorrow may rain, so I'll follow the sun. And so my love I must go. In the end you'll know, oooh. One day you'll find that I have gone. Yes, tomorrow may rain, so I'll follow the sun. I think you're fine 'cause we love you, Mr. Moonlight. Begging if you please, and the nights you don't come my way. Say you do, baby, when you don't? Tell the truth now, is love real? I say you will when you won't, oh honey, don't. You got that sand all over your feet. Sunday morning you don't look right. uh baby, been stepping around. Well they took some honey from the tree, dressed it up and they called it me. Everybody's trying to be my baby now. Wicked woman knocking at my door. Called her home, had a nice teen date.